Continuing on with the pizza and pesto of the previous posts, here is a pizza stacked with some awesome flavours! Delicious fresh pesto, juicy mushrooms, savoury red onion, finished off with the smokey flavour of creamy smoked gouda! A pizza that not only looks great, but tastes awesome too! 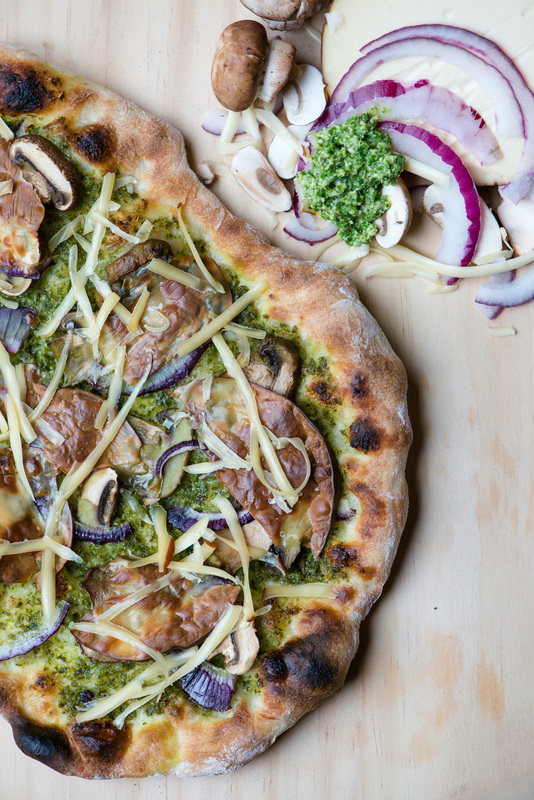 Fresh pesto, juicy mushrooms, savoury red onion, and smoked gouda cheese make this one killer pizza! If you won't be using all the dough right away, refrigerate it, and remove it from the fridge 1-2 hours before cooking allowing it to warm to room temperature. While dough is resting, if using a pizza stone, place it in the cold oven and turn the heat to 500F (or as close to that heat as possible), allowing the oven to heat for about an hour. If you don't have a pizza stone, arrange the pizza dough on a baking sheet, and just preheat the oven to 500-550F. Spread pesto on the dough, top with sliced mushrooms, red onions, and slices or shredded smoked gouda. If using a baking sheet, bake at 500-550F, if using a pizza stone, turn your oven to broil and cook the pizza for 5-10 minutes until desired doneness. Stay tuned for one more pizza coming to the blog soon! I’m think maybe a breakfast pizza with a delicious runny egg yolk on top of everything? MMMM! A beautiful, flavourful recipe! Pizza night just got a lot more exciting! Thanks for sharing! It looks great! I’ll try it at home. Thanks Kevin, it was very tasty!